... Political motive suspected A Senior Lecturer at the Institute of Professional Studies (IPS) has been denied his election to the membership of the institute's governing council, apparently on account of being a member of the National Democratic Congress (NDC), a move seen by many as giving credence to the perception of selective justice by the New Patriotic Party (NPP) administration. The Chronicle can report that there is a growing tension at the campus following the deletion, by the sector minister, of the name of the senior lecturer, Mr. Joshua Alabi from the list of the newly elected council members. Mr. Alabi, a former minister in the NDC administration now holds the high profile position of campaign manager of the party's presidential candidate, Professor J.E.A. Mills. The registrar, the director of the IPS and the chairman of the governing council were reported to have gone to put the grievances of the senior staff of the school to the minister over the removal of Mr. Alabi's name. According to documents sighted by The Chronicle, Mr. Alabi was the only senior staff who filed his nomination and was declared unopposed but his name was later dropped. 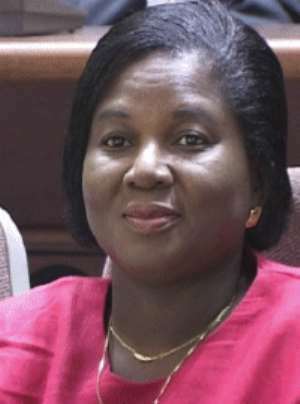 Ms Elizabeth Ohene, Minister of State in Charge of Tertiary Education, was characteristically blunt in her reasons for nominating another member who was not voted for during the elections instead of Mr. Alabi. She told The Chronicle that the selection of the other candidate in place of Alabi was a decision taken on her own prerogative. She continued, “Why don't you ask of other members who were not nominated but rather Alabi? Alabi was a member of the old council and their term of office was over as far back as August last year and I wrote to dissolve it for a new council to be formed. I requested for three names for me to pick an appropriate candidate. According to the Minister she was not prepared to go into any legal tussle with anybody, stressing that her main objective was to ensure that tranquility and peace prevailed at the institution. “I don't want to go into any legal tussle, not that I have done anything legally wrong. Alabi is not a special person but we are taking steps to address the concerns raised,” she stated. Mr. Alabi's election followed a letter dated October 6, 2003 signed by the Acting Registrar of IPS, Mr. W.B Dapaah, informing all senior members of the school about the reconstitution of the governing council in line with the statutes of the Institute. Senior members representation on the Council is composed of one senior lecturer and one lecturer, and according to the letter Mr. Alabi as the only senior lecturer who had filed his nomination, was therefore the unopposed choice but would not be voted for. The names of the other two nominees together with Mr. Alabi were conveyed in another letter dated January 12, this year, to the Minister of Education, Youth and Sports, Mr. Kwadwo Baah Wiredu, through the Executive Secretary of the National Council for Tertiary Education. At the election on October 14, 2003, Mrs. Helen Arkorful, a lecturer, had eight votes, Mr. Gerald Dapaah Gyamfi, a lecturer had five, and Mr. B.A. Puplampu, also a lecturer had three votes. Mrs. Arkorful was accordingly declared the winner to join Mr. Alabi as members of the IPS Council. However Mr. Alabi's name was dropped and replaced him with Dapaah Gyamfi who had lost the elections.